I remember some of you guys commenting on my lastest beauty haul saying that I’ll love this product. And do you know what? I LOVE THIS PRODUCT! Does everything I want for my thin, fine hair. After all the bleaching and dying, ends are dry. Apply this on my hair after shampoo making sure the ends have enough then leave it on for 5 mins. A small amount is needed rather than a large amount as stated on the packaging. The texture is thick. Wash it off then style it. First of all, the smell. It is absolutely gorgeous. Has more of a floral, sweet smell. Not overpowering, just the right amount. This has made blowdrying and styling a lot easier and manageable. Without this, the ends would get tangled and knotted easily after washing my hair. An added bonus is that this product has heat protection which I didn’t know till I read on the website. Great for those who use heat everyday. Leaves your hair so soft and smelling nice. I keep feeling and stroking my hair after using it, it’s that soft. I use it twice a week. Condition of your hair will improve. There are 2 types of hair masks. This one and the Rich Premier (orange). This one is best suited for limp, fine, thin hair. For those who doesn’t want a mask to weigh their hair down. Those of other hair types are welcome to use this too! I have fine, thin, flat hair which is a nightmare for me. Wishing I had thick, volumous hair. Many masks tend to weigh my hair down but this one didn’t. 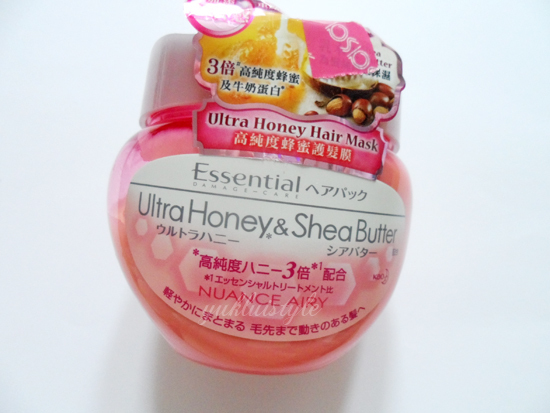 I will definitely repurchase this! Purchased this in Hong Kong which worked out to be around £4 something p. It is worth it. But if you purchase it online on eBay, it’s £12 annoyingly. Will have to stock up when I go next year. Going to have to try the rest of the range. Do You Paint Your Nails Like This? I've never tried Naunce Airy before, but Rich Premier is my absolute adoration. It's incredible what it does for damaged hair too! 🙂 I have rather thick hair so I think it suits me more. I wonder if we add the shampoo and conditioner plus the hair mask, our hair would overload with awesomeness?